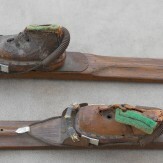 Salesman's sample hand carved wooden skis, with miniature cable binding and leather boots. Boots have laces and felt tops. They are in fair shape. The skis have small holes above the bindings - they were probably attached to a sales display of some type. Wonderful and rare. 20" long.